This is a stunning likeness of James Baldwin, a deeply alienated man. He was black and homosexual at a time when it was difficult to be either in America. He lived a nomadic life, from Paris to New York to Istanbul. This wonderful characterization shows a man who seems to be constrained by his clothing: the unusual shadow behind him could allude to his hidden selves. This portrait is one of 44 photographs of authors given to Carleton in 1984 by Raphael Bernstein, a Carleton parent and former trustee, for the opening of the expanded library. 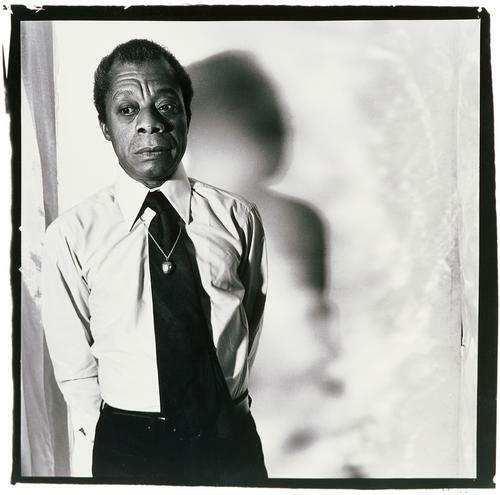 These photographs of significant authors, taken by master photographers, form an important group exhibited regularly in the library. The collection also has toured to several museums.